Before we spend countless hours researching a company, we’d like to analyze what insiders, hedge funds and billionaire investors think of the stock first. We would like to do so because our research has shown that the elite investors’ consensus returns have been exceptional. 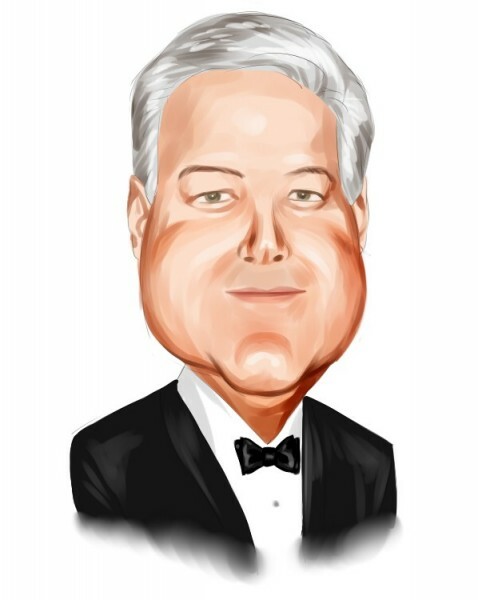 In the following paragraphs, we find out what the billionaire investors and hedge funds think of Mettler-Toledo International Inc. (NYSE:MTD). Mettler-Toledo International Inc. (NYSE:MTD) was in 22 hedge funds’ portfolios at the end of December. MTD has experienced an increase in activity from the world’s largest hedge funds in recent months. 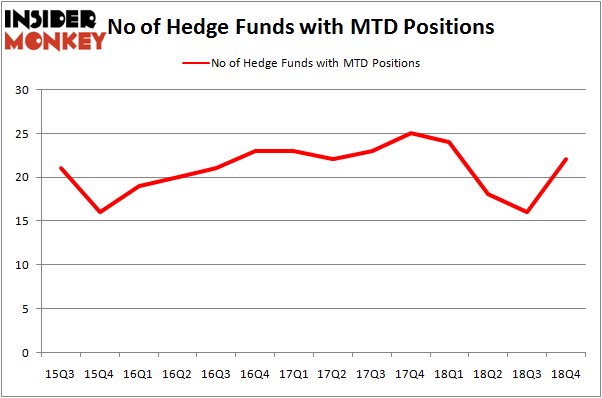 There were 16 hedge funds in our database with MTD holdings at the end of the previous quarter. Our calculations also showed that MTD isn’t among the 30 most popular stocks among hedge funds. We’re going to take a look at the new hedge fund action encompassing Mettler-Toledo International Inc. (NYSE:MTD). What does the smart money think about Mettler-Toledo International Inc. (NYSE:MTD)? At the end of the fourth quarter, a total of 22 of the hedge funds tracked by Insider Monkey were bullish on this stock, a change of 38% from the previous quarter. Below, you can check out the change in hedge fund sentiment towards MTD over the last 14 quarters. So, let’s check out which hedge funds were among the top holders of the stock and which hedge funds were making big moves. Among these funds, AQR Capital Management held the most valuable stake in Mettler-Toledo International Inc. (NYSE:MTD), which was worth $71.7 million at the end of the third quarter. On the second spot was GLG Partners which amassed $29.8 million worth of shares. Moreover, Winton Capital Management, Chilton Investment Company, and PDT Partners were also bullish on Mettler-Toledo International Inc. (NYSE:MTD), allocating a large percentage of their portfolios to this stock. As aggregate interest increased, specific money managers have been driving this bullishness. Element Capital Management, managed by Jeffrey Talpins, created the largest position in Mettler-Toledo International Inc. (NYSE:MTD). Element Capital Management had $10.5 million invested in the company at the end of the quarter. Matthew Tewksbury’s Stevens Capital Management also initiated a $3.1 million position during the quarter. The other funds with brand new MTD positions are Andrew Feldstein and Stephen Siderow’s Blue Mountain Capital, Dmitry Balyasny’s Balyasny Asset Management, and Ray Dalio’s Bridgewater Associates. Let’s go over hedge fund activity in other stocks similar to Mettler-Toledo International Inc. (NYSE:MTD). These stocks are CenterPoint Energy, Inc. (NYSE:CNP), Mylan N.V. (NASDAQ:MYL), Genuine Parts Company (NYSE:GPC), and Maxim Integrated Products Inc. (NASDAQ:MXIM). This group of stocks’ market valuations match MTD’s market valuation. As you can see these stocks had an average of 32 hedge funds with bullish positions and the average amount invested in these stocks was $1113 million. That figure was $242 million in MTD’s case. Mylan N.V. (NASDAQ:MYL) is the most popular stock in this table. On the other hand Maxim Integrated Products Inc. (NASDAQ:MXIM) is the least popular one with only 24 bullish hedge fund positions. Compared to these stocks Mettler-Toledo International Inc. (NYSE:MTD) is even less popular than MXIM. Considering that hedge funds aren’t fond of this stock in relation to other companies analyzed in this article, it may be a good idea to analyze it in detail and understand why the smart money isn’t behind this stock. This isn’t necessarily bad news. Although it is possible that hedge funds may think the stock is overpriced and view the stock as a short candidate, they may not be very familiar with the bullish thesis. Our calculations showed that top 15 most popular stocks among hedge funds returned 19.7% through March 15th and outperformed the S&P 500 ETF (SPY) by 6.6 percentage points. Hedge funds were also right about betting on MTD as the stock returned 25.3% and outperformed the market as well. Here is What Hedge Funds Think About American Airlines Group Inc (AAL) Here’s What Hedge Funds Think About ABIOMED, Inc. (ABMD) Here’s What Hedge Funds Think About Cheniere Energy, Inc. (LNG) Did Hedge Funds Drop The Ball On Markel Corporation (MKL) ? Here’s What Hedge Funds Think About Total System Services, Inc. (TSS) Did Hedge Funds Drop The Ball On Plains All American Pipeline, L.P. (PAA) ?